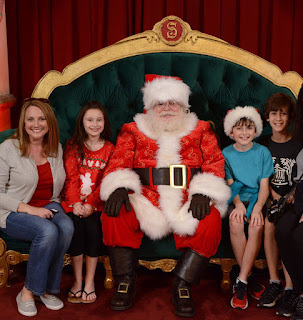 On a Friday after school, I loaded up the kids (and a friend) and we headed to Hollywood Studios to visit with Santa! Oh. My. Heavens. We LOVED him. Santa is in a gift shop down near the exit to Beauty and the Beast (down Sunset Blvd). He was so sweet and so authentic. And, don't forget to grab your sequined Christmas mouse ears while there!